Healthaid HEALTHAID NURIDEEN (VITAMIN C, ZINC, SILICA, MARINE FISH EXTRACT) Product #: SOM Price: Rs.1287.00 Rs.1287.00	Available from: SAVEONMEDICALS.COM In stock! Order now! What is the frequency of use of HEALTHAID NURIDEEN (VITAMIN C, ZINC, SILICA, MARINE FISH EXTRACT)? Have you been prescribed HEALTHAID NURIDEEN (VITAMIN C, ZINC, SILICA, MARINE FISH EXTRACT) by a doctor? How do you rate HEALTHAID NURIDEEN (VITAMIN C, ZINC, SILICA, MARINE FISH EXTRACT) on price? Q1) Is HEALTHAID NURIDEEN (VITAMIN C, ZINC, SILICA, MARINE FISH EXTRACT) effective? Q2) What is the frequency of use of HEALTHAID NURIDEEN (VITAMIN C, ZINC, SILICA, MARINE FISH EXTRACT)? Q3) Have you been prescribed HEALTHAID NURIDEEN (VITAMIN C, ZINC, SILICA, MARINE FISH EXTRACT) by a doctor? 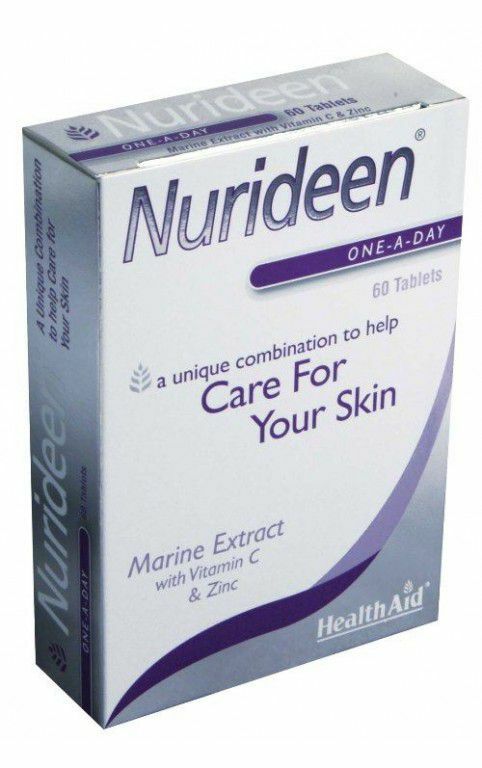 Q4) How do you rate HEALTHAID NURIDEEN (VITAMIN C, ZINC, SILICA, MARINE FISH EXTRACT) on price? Q5) What is your overall rating of HEALTHAID NURIDEEN (VITAMIN C, ZINC, SILICA, MARINE FISH EXTRACT)? Is HEALTHAID NURIDEEN (VITAMIN C, ZINC, SILICA, MARINE FISH EXTRACT) effective?